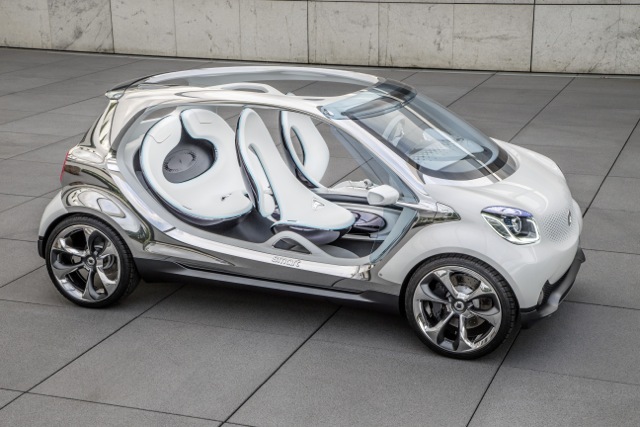 Smart has unveiled its newest concept car, the fourjoy concept, which is slated to debut next week at the Frankfurt Motor Show. The compact four-seater is an electric concept car that previews the next generation four-door smart, and it is expected to arrive late next year. The fourjoy concept’s styling is similar to last year’s forstars concept, but features no doors, no rear window and an open roof. At only 137 inches long the fourjoy concept is perfect for an urban environment. The fourjoy concept is powered by a rear mounted 55 kW electric motor and a 17.6 kWh lithium-ion battery. It takes up to seven hours to recharge the concept using an standard household outlet, but can be recharged in less than an hour with a quick charger. 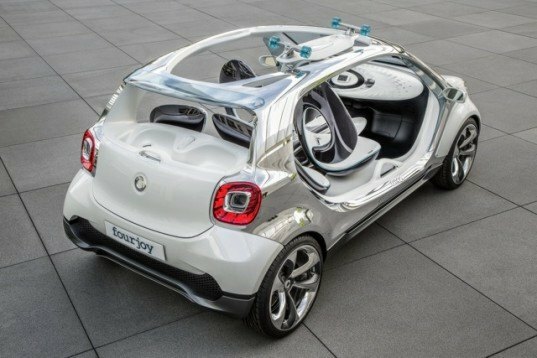 Once you park the fourjoy concept, you can continue to get around with two electric longboards fastened to the roof of the smart fourjoy. Helmets and a high-definition camera are stowed under the rear seats. It needs windows roof and doors. To much inclement/seasonal weather in Canada for something without those. Try driving one of these at -30 degrees Celsius. Let's talk more about those electric longboards, shall we?